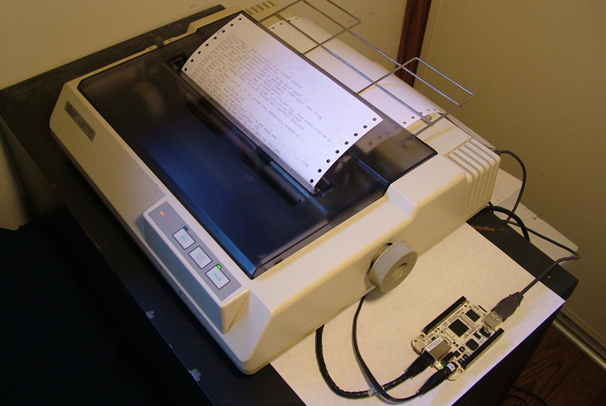 Twitter tickers have been around for a little while now, but this creative use of an old dot matrix printer by a modder named Kenneth is really a fun way to utilize old technology. Kenneth picked up an old dot matrix printer from a swap meet for only $5--what a steal! He then used a BeagleBone--basically Texas Instruments's version of an Arduino board, to connect it to the Internet and monitor his Twitter feed. 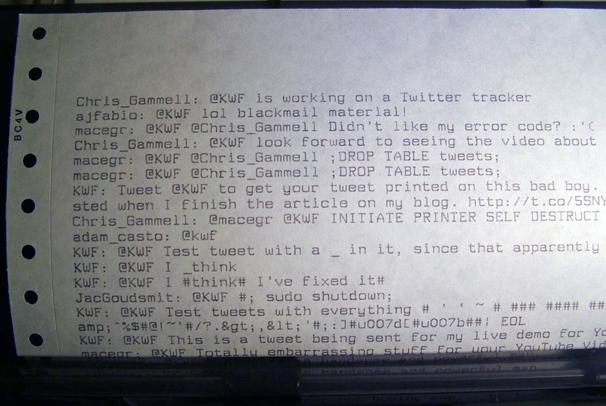 The BeagleBone board uses the Twitter API to grab any tweets that mention his username (@KWF) and then prints them out--noisily. Kenneth has posted all of the code you'll need if you want to re-create his awesome retro Twitter ticker, provided you've got the necessary equipment. If you know what you're doing, it shouldn't be too difficult to modify the code to watch for search terms or other things you might be interested in. I’ve wanted to make my own Twitter ticker for a little while now, so I’m definitely going to be asking my parents for their old dot matrix printer and the box of paper they have stashed somewhere. Now I just got to figure out how to make it work with an Arduino, any ideas?